During my thirty-one years of Army service I studied D-Day in many venues including West Point, the Artillery School, the Command and General Staff College, and The Army War College. The importance of General Eisenhower’s weather decision was always appreciated and discussed but never explicated to the degree John Ross has in his wonderful book – a must read for military leaders and the historians who report on them. – Colonel James C. Peterson, U.S. Army, Retired. John Ross’s account of the circumstances surrounding the D-day forecast is insightful and supremely readable. Obtaining accurate weather data during wartime was extremely hazardous. Weather sections of the US Army Air Force, the Royal Navy, and the British Met Office forcefully fed often conflicting views to Ike’s chief weatherman, James Martin Stagg. He had to meld them into one forecast to which all agreed. The book brought me face to face with General Eisenhower as he listened to Stagg deliver the forecast that saved D-day. – Colonel Tom Accola, U.S. Air Force, Retired. Col. Accola was a career USAF weather officer and the staff weather officer for US Army in Europe. He is a director of the Air Force Weather Association. During their joint ride to the Capitol for his inauguration, Kennedy asked Eisenhower why the Normandy invasion had been so successful. 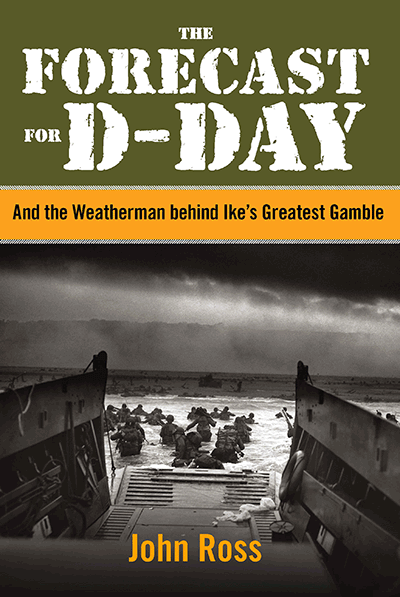 Ike’s answer was terse: “Because we had better meteorologists than the Germans!” Vividly, Ross’s book tells this story. Highly recommended. – Charles C. Bates, Ph.D., Duty surf forecaster at the Admiralty on the night of the invasion. Concluded professional career as Chief Scientist for the US Coast Guard. Co-author America’s Weather Warriors. The D-Day weather forecast was arguably the largest gamble of World War II and through the persistent efforts of John Ross we can now better appreciate the behind the scenes drama and genius that opened a small yet exploitable operational window that the Allies exploited to achieve victory. – Thomas E. Crew, Naval Meteorological and Oceanography Command and author of Combat Loaded: Across the Pacific on the USS Tate. A wonderful piece of research on a little-known aspect about D-Day. The fascinating background concerning the difficulty of predicting the weather for D-Day without which Eisenhower could not have made his momentous decision. A fine editor told me, "There's always someone who knows more about your subject than you." I'd deeply appreciate your comments and questions so that the next edition gets it right.